A pillar candle is a candle that can be burned without having to be placed in some kind of a holder. A pillar candle can be placed onto a tray or a stand, but it will stand straight and burn without a holder. There are specific methods for burning a pillar candle that will ensure even melting and desired results. Learn the proper way to burn a pillar candle. 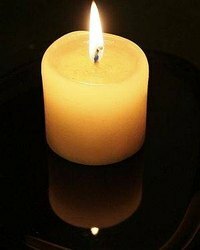 Trim the candle wick to approximately 1/8 inch before the initial burning of a pillar candle. Light the candle with the lighter. It is important to allow a pillar candle to burn one hour for each inch of diameter during the initial burning. For example, a 3-inch pillar candle should burn for three hours during the initial burning. Doing this will ensure that the pillar candle will burn evenly and will prevent the wick from becoming immersed in melted wax during subsequent burnings. Use the pillar candle for candlelight until it is approximately one inch tall. Burning a pillar candle down further than this point is a fire hazard. For best results, place a pillar candle on a plate or tray as it is burning. The plate will capture and contain any dripping wax. When a pillar candle is burned properly, it will melt down through the center of the candle and the outer part of the candle will continue to stand. If you are concerned about wasting the outer wax and would prefer to have it melt along with the pillar candle, the candle can be squeezed and manipulated gently while the wax is warm. This will fold the candle sides into the center and help to incorporate the sides into the melting wax as the candle burns. Keep discarded matches and pieces of burned wick out of the center area of the candle. These items can create fire hazards. Never leave burning candles unattended.